It's that time again! I had so much fun checking out last week's links and pinning them all! I hope you all checked them out too! Thank you everyone who participated! If you would like to be a guest host, please click the "contact me" tab on the left, to email me! Are you ready for this week's features? Remember, if you are featured, your button gets a "Featured Guests" spot in my right sidebar! Hey Mommy, Chocolate Milk shared a fun learning activity: See and Spell Bottle Caps! 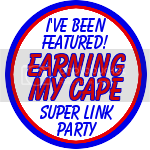 Thanks for sharing and Don't forget to grab your featured button! 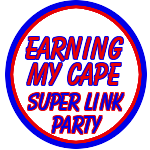 I invite you to follow Earning-My-Cape via Google Friend Connect, Bloglovin', Facebook, Twitter, Pinterest or RSS, but it isn't required. Grab my Super Link Party button. Put it somewhere on your blog or in a post. I'd love if you would invite others to join the party and link up! Link up! Link up to 5 projects. Keep it family friendly, please- crafts, DIY, recipes, printables, etc. (Please no stores, giveaways, linkys or hops.) Make sure you link to the page itself, not to your home page. By linking up, you agree to me featuring a photo of your project on my blog. Click and Comment. Please visit at least 2 other links and leave a comment on their blog. We all love comments, right? Thanks for hosting, Susie - have a great week! 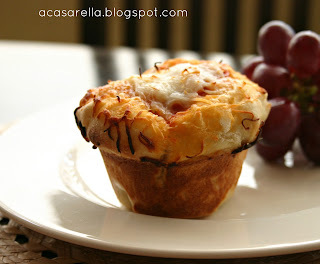 Thanks for featuring my pizza muffins! Thanks for hosting! I almost missed this one (another busy week! ).